As 2012 draws to a close, it's tempting to look back. 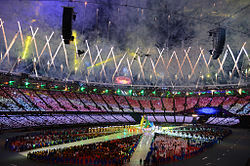 Needless to say, the Olympics were a very definite highlight - even if I missed most of it (Opening Ceremony excepted). Happily, Santa got me the 5xDVD Best Of, and this evening I watched - and Liz & the girls re-watched, fairly willingly - the Closing Ceremony for the first time. It was OK, not a patch on Danny Boyle's opener, but it had its moments. This is embarrassing, but before the games I'd never heard of One Direction, Ed Sheeran, Emeli Sandé, Jessie J, Tinie Tempah or Taio Cruz, nor did I know that Liam Gallagher had a band called Beady Eye. Must be getting old... And I still don't get Russell Brand. Nor why Annie Lennox is always wheeled out on this type of occasion. On the other hand, I surprised myself by enjoying the Spice Girls on their taxis, and Muse, but the rest rushed by like so much YouTube. Shame that Bowie and Bush couldn't be persuaded; the latter's Running Up That Hill was a highlight, even without her. Tomorrow I might even get around to watching the sport.